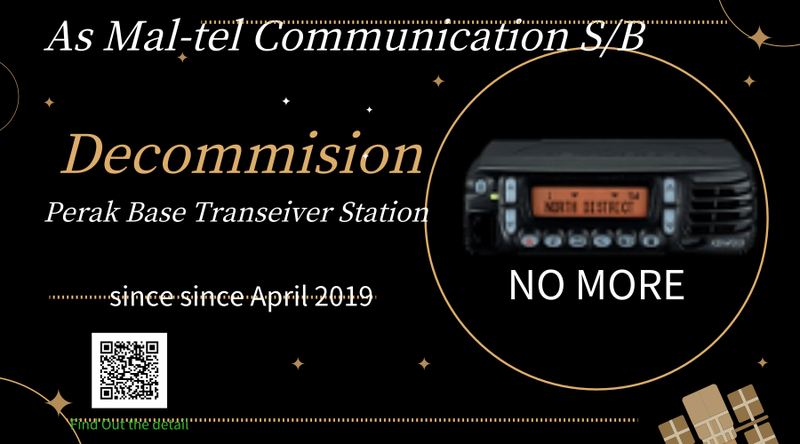 I received a memorandom that Maltel officially announced they will decomission Perak trunk radio Base station start from April 2019. This memorandom is published with Mal-Tel Communicaiton letter head with their Senior Sales Manager signature. I have read the memorandum twice, through out the letter, I did not see any proposal to minimize the impact to the users. 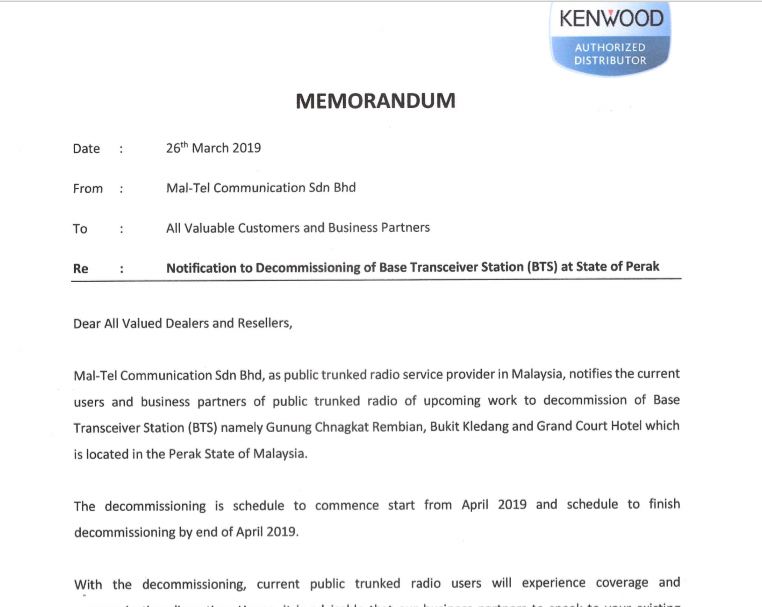 Download the pdf file for Maltel Decommission Perak Base Transceiver Station here. We have introduced to our reader that Mal-tel Communication Sdn Bhd is a trunk radio service provider in Malaysia. They are the dealer for Kenwood and Hytera trunk radio in this region. Many users have committed to Kenwood trunk radio system 2 years ago while Malaysia government want to migrate to digital trunk radio. Personally, I really astonish and shock to read this letter. The trunk radio service provider plays an important role in Malaysia communication sector. They have to deposit a lump sum amount in order to apply for frequency band from MCMC. I guess the Malaysia Government has awarded frequency band to the service provider with criteria to follow. The decommissioning of the base-station announcement should also get consent from the authorities department. There are just many doubts to clear after read this single side, inconsiderate memorandum announcement. As a walkie talkie supplier in Malaysia, WOKI Talk had taken the initiative to call Mal-tel Communication to further understand the situation. I had called Maltel CEO, and he only briefed me this issue was handle by their Senior Sales Manager. He also politely asked me to talk to the Senior Sales Manager on details or wait for their further plan. However, during their conversation, the CEO, Mr Simon Yew also rest assure me that the Perak Base Station will not decommission in April 2019 and will only do until the users are fully change to their propose scheme.